“If you would consider the idea of coming up here with me right now and giving an impromptu speech risky, then I want you to get ready,” he said, before inviting someone to step out from the audience and join him on stage. However, when Lee Jennings, a second-year student from Hattiesburg, volunteered and made his way to the stage, instead of asking Jennings about his career plans, Thompson remarked on the risk Jennings had taken. Before he finished, Thompson gave Jennings one condition: that he do the same for another student pharmacist someday. Jennings said he was initially “stunned,” but after registering Thompson’s words, felt extremely grateful, noting that the scholarship will significantly defray his student loan burden. He also expressed gratitude to Thompson for the lesson he imparted. “I want to own a pharmacy one day, and I know that buying or building a pharmacy is a major risk,” Jennings said. “This experience taught me that reward doesn’t come without a risk. 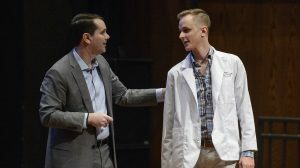 Jennings hopes to fulfill his promise to Thompson and pay his good fortune forward not only for another student pharmacist in the future, but also in the community where he will someday practice his profession. “This is an incredible gesture and illustration for our student pharmacists,” said David D. Allen, dean of the School of Pharmacy. “Taking innovative risks is how we as pharmacists can improve health care. Thompson credited his time at Ole Miss for teaching him the importance of risk-taking that he sought to convey with the lecture. “Those times when I have done something that was uncomfortable or that I wasn’t quite sure I was ready to do, that is when I have seen my greatest growth,” Thompson said. For more information on pharmacy education at Ole Miss, go to http://pharmacy.olemiss.edu/.